I must admit I did ponder on whether to call this post the importance of wedding vows because I feel perhaps that I am stating the obvious, right? But on second thoughts, I have decided that just because the importance of wedding vows is obvious too me, it doesn’t mean that it’s as obvious to everyone else. So this is my shot at making sure that everyone knows! So, what the hell is a wedding vow anyway? My battered Oxford English dictionary (yes, I still have a hard copy of a dictionary!) defines a vow as ‘ A solemn promise or a set of solemn promises committing one to a prescribed role, calling, or course of action, typically a marriage. Well, that’s pretty damn boring if I say so myself. In my experience vows are far from solemn, but I’ll get to that later. Okay, let me try something else. A wedding vow, is in my definition, a beautiful statement, promise, or pledge about or to, the love of your life. It’s from the heart, it’s from the soul and its sheer honesty can bring out the laughter and tears and most of all a renewed sense of love. Wedding vows truly are what you make of them and there should be no restrictions on what you do with your vows. However, saying that, depending on the type of ceremony you are having, there may be a legally required question vow which is asked of you and that you have to respond to, to satisfy contractual requirements. But beyond that, there should be absolutely no reason why you cannot then follow those set wedding vows, with your own personal pledges to each other. If a celebrant or registrar tells you otherwise, you tell them to come and speak to me! In my own ceremonies, I try to encourage couples to have a two-part wedding vow, which comprises of a question vow (of their choice or design that I ask them), which I feel adds a formalisation to the vow exchange, followed by their personal pledges to each other. Here is an example below of this exact format that one on my lovely couples wrote for their wedding ceremony. You can see that they played around with a traditional question vow to reflect exactly what they wanted to say, then followed on with their own, individual pledges. Me: Sonny do you now take Cher to be your wedded wife and to share your life with her? Do you promise to love her, comfort her and honour her, in sickness and in health, through the laughter and the tears, as long as you both shall live? Me: Cher do you now take Sonny to be your wedded husband and to share your life with him? Do you promise to love him, comfort him and honour him, in sickness and in health, through the laughter and the tears, as long as you both shall live? Sonny: Cher, I take you to be my loving wife. Knowing and accepting you for who you are. My best friend, through giggles and tears, thick and thin; You are my pillar of strength in times of need. Through the pressures of the present and the uncertainties of the future. I promise you my deepest love, my fullest devotion and my most tender care. My heart is your home and my arms are your shelter. For ever and ever, I am yours to keep. Cher: Sonny, I take you, to be no other than yourself, loving what I know of you, trusting what I do not yet know, with respect for you as an individual, and faith in your love for me, without our friends and families as my witness, I promise to love you as your wife and as your friend, the only way I know how, completely and forever. How lovely! Or not, in some cases. Some of you may have read those vows and immediately poked your two fingers down your throat. That’s fine too. I want people to have that reaction, because then you’ll be one step closer to knowing what type of wedding vow you do want, by eliminating what you don’t want. I would hate for your friends and family to hear your vows and to wonder whether you have been abducted by aliens. What do I mean by this? Well, I mean that, if your vows sound so unlike you, or anything that you would say and are not reflective of you as an individual or a couple that your guests begin to wonder who it is who is really saying those words, then that’s not good. 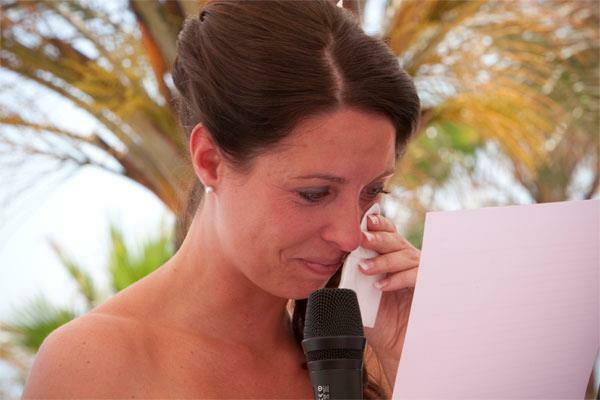 Wedding vows must be an honest reflection of how you think, how you feel and who you are. At the start of this post, I mentioned that in my experience, the vows I hear are rarely solemn, and this is so very true. 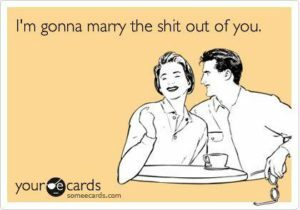 Check out this post here on funny wedding vows and this post on how to write funny wedding vows. A wedding vow that is not solemn, is not any less serious or heartfelt, it’s simply more in spirit with the individual who is pledging it. Let me give you an example of some vows, from one of my other lovely couples, which I think are not only very funny, but realistic, honest and reflective of the gorgeous man who wrote them. I also promise to love, honour a bit, and make you think you’re being obeyed. Except your ironing – I won’t do that. But what I will do is take you in my arms when you need to be held. I will listen when you need to talk. I will laugh with you in times of joy, and comfort you in times of sadness. And then look how in contrast, his partner’s wedding vows are honest yet different and more true to his personality. There really is no reason why you cannot use your pledge to state your intentions for the future, even the sacrifices that you will be making, and to have your guest bear witness to those statements! I have had women promise not to get in a mood when the football is on and men promise to overlook the unexplained purchases on the credit card. As long, as what you say is in good taste and won’t make anyone feel awkward or upset, then the boundary of honesty is quite wide. So there you have it, vows rock, so get writing. And if you’re not feeling inspired yet, please have some one check your pulse.